Boeing CEO Dennis Muilenburg promised President-elect Donald Trump in a phone call Tuesday that the company will work to limit the cost of the new Air Force One after Trump threatened to cancel plans for at least two new presidential jets. 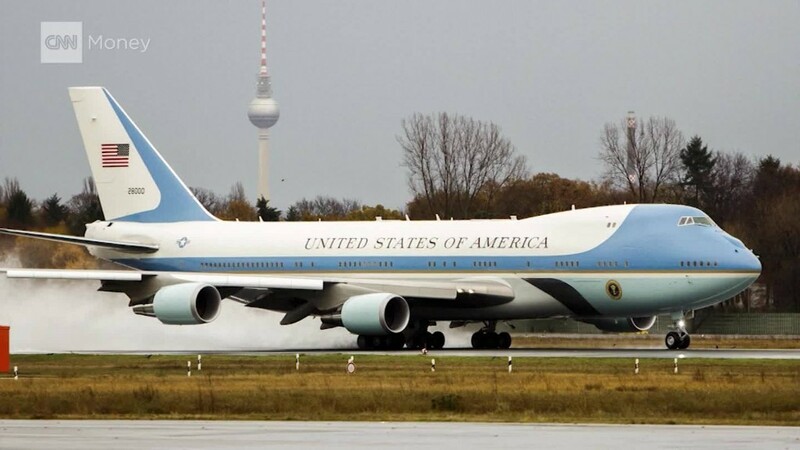 "Muilenburg congratulated Mr. Trump on his election win and committed to working with the new administration to control costs as they establish requirements for the new Air Force One to keep the program as affordable as possible and deliver the best value to American taxpayers," said Boeing's statement. "They also discussed the overall importance of American manufacturing and Boeing's continuing strong contribution and commitment to U.S.jobs." Boeing is the nation's largest exporter, although it has opened a facility in China to finish jets being sold to Chinese airlines. Boeing has 151,641 U.S. workers and only a few thousand at facilities outside the United States. No matter what happens with Air Force One, it's important for Boeing (BA) to maintain a good relationship with the incoming administration. Boeing is a major defense contractor, in addition to its business making commercial jets. It had about $26 billion worth of sales from U.S. government contracts last year, which amounted to 27% of its annual revenue, according to its annual report. Trump tweeted Tuesday morning that the plans for at least two new Air Force One jets should be canceled due to the cost. "Boeing is building a brand new 747 Air Force One for future presidents, but costs are out of control, more than $4 billion. Cancel order!" he tweeted. The exact cost of the new planes has yet to be set, although the Air Force has budgeted $2.9 billion for the program through 2021. Boeing's only existing government contract is for $170 million to do planning for the new planes. But Trump told reporters later Tuesday that the cost of the planes was totally out of control. "I think it's ridiculous," he said. "I think Boeing is doing a little bit of a number. We want Boeing to make a lot of money, but not that much money." Trump took a slightly more conciliatory approach to Boeing when was interviewed on NBC's Today Show Wednesday morning, leaving open the possibility of going ahead with the planes if the cost comes down. "I spoke to a very good man yesterday, the head of Boeing, terrific guy, and we're going to work it out," said Trump. "But you know, that's what I'm here for. I'm going to negotiate prices. Planes are too expensive. We're going to get the prices down. If we don't get the prices down, we're not going to order them, we'll stay with what we have." The two current Air Force One jets started service in 1990 under the administrations of George H.W. Bush, and they are reaching near the end of their planned life.